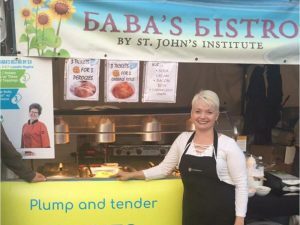 Pumping non-stop like a healthy heart, Suzanna Brytan’s ladle dips from pan to plate, serving an unending supply of plump and tender perogies and fuelling Baba’s Bistro with her energy and enthusiasm. Like the restaurant it’s named after, the booth at Taste of Edmonton specializes in Ukrainian comfort food. Both restaurant and booth serve to raise funds for St. John’s Institute, a non-profit organization that provides affordable housing and food services. Brytan says one of the best things about volunteering at Taste of Edmonton is when the vendors swap food with each other. “I love food, but I hate boring food,” she says, freely admitting that the cheese bread from Pampa Brazilian Steakhouse is her favourite from another booth.